(Nanowerk News) Unlike Bilbo's magic ring, which entangles human hearts, engineers have created a new micro-ring that entangles individual particles of light, an important first step in a whole host of new technologies. Entanglement - the instantaneous connection between two particles no matter their distance apart - is one of the most intriguing and promising phenomena in all of physics. Properly harnessed, entangled photons could revolutionize computing, communications, and cyber security. Though readily created in the lab and by comparatively large-scale optoelectronic components, a practical source of entangled photons that can fit onto an ordinary computer chip has been elusive. New research, reported today in The Optical Society's (OSA) new high-impact journal Optica ("Micrometer-scale integrated silicon source of time-energy entangled photons"), describes how a team of scientists has developed, for the first time, a microscopic component that is small enough to fit onto a standard silicon chip that can generate a continuous supply of entangled photons. The new design is based on an established silicon technology known as a micro-ring resonator. These resonators are actually loops that are etched onto silicon wafers that can corral and then reemit particles of light. By tailoring the design of this resonator, the researchers created a novel source of entangled photons that is incredibly small and highly efficient, making it an ideal on-chip component. "The main advantage of our new source is that it is at the same time small, bright, and silicon based," said Daniele Bajoni, a researcher at the Università degli Studi di Pavia in Italy and co-author on the paper. "The diameter of the ring resonator is a mere 20 microns, which is about one-tenth of the width of a human hair. Previous sources were hundreds of times larger than the one we developed." Scientists and engineers have long recognized the enormous practical potential of entangled photons. This curious manifestation of quantum physics, which Einstein referred to as "spooky action at a distance," has two important implications in real-world technology. First, if something acts on one of the entangled photons then the other one will respond to that action instantly, even if it is on the opposite side of a computer chip or even the opposite side of the Galaxy. This behavior could be harnessed to increase the power and speed of computations. The second implication is that the two photons can be considered to be, in some sense, a single entity, which would allow for new communication protocols that are immune to spying. This seemingly impossible behavior is essential, therefore, for the development of certain next-generation technologies, such as computers that are vastly more powerful than even today's most advanced supercomputers, and secure telecommunications. To bring these new technologies to fruition, however, requires a new class of entangled photon emitters: ones that can be readily incorporated into existing silicon chip technologies. Achieving this goal has been very challenging. To date, entangled photon emitters - which are principally made from specially designed crystals -- could be scaled down to only a few millimeters in size, which is still many orders of magnitude too large for on-chip applications. In addition, these emitters require a great deal of power, which is a valuable commodity in telecommunications and computing. To overcome these challenges, the researchers explored the potential of ring resonators as a new source for entangled photons. These well-established optoelectronic components can be easily etched onto a silicon wafer in the same manner that other components on semiconductor chips are fashioned. To "pump," or power, the resonator, a laser beam is directed along an optical fiber to the input side of the sample, and then coupled to the resonator where the photons race around the ring. This creates an ideal environment for the photons to mingle and become entangled. 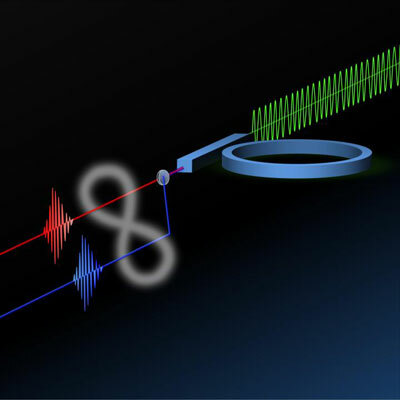 As photons exited the resonator, the researchers were able to observe that a remarkably high percentage of them exhibited the telltale characteristics of entanglement. "Our device is capable of emitting light with striking quantum mechanical properties never observed in an integrated source," said Bajoni. "The rate at which the entangled photons are generated is unprecedented for a silicon integrated source, and comparable with that available from bulk crystals that must be pumped by very strong lasers." The researchers believe their work is particularly relevant because it demonstrates, for the first time, a quintessential quantum effect, entanglement, in a well-established technology. "In the last few years, silicon integrated devices have been developed to filter and route light, mainly for telecommunication applications," observed Bajoni. "Our micro-ring resonators can be readily used alongside these devices, moving us toward the ability to fully harness entanglement on a chip." As a result, this research could facilitate the adoption of quantum information technologies, particularly quantum cryptography protocols, which would ensure secure communications in ways that classical cryptography protocols cannot. According to Bajoni and his colleagues, these protocols have already been demonstrated and tested. What has been missing was a cheap, small, and reliable source of entangled photons capable of propagation in fiber networks, a problem that is apparently solved by their innovation.